Anton Chekhov is a well-known playwright in the theatre world because he has a knack for making you think outside the conventional box. Born in 1860 in Russia, Chekhov produced four infamously classic plays and a number of short stories. The Cherry Orchard is the last of his great works and has a heavy player in the theatre circuit ever since it’s debut in 1904. The New Theatre, nestled in one of the busiest and most creative districts of Sydney, Newtown, has a knack for bringing old and new tales to life with little to no budget. It’s almost unheard of and at times unbelievable, but the passion that comes forth is a real credit to New Theatre’s name. I caught the opening night of The Cherry Orchard at New Theatre, on now until the 28th of May. Chekhov’s ironically funny and yet tragic play has been adapted for the modern audience by David Mamet and brought to life by director Clemence Williams. Along with a cast of young and old Sydney talent, this adaptation of The Cherry Orchard lights up every dark corner of the room and every bleak crevice of class, aristocracy, money, deception, lust, and family. It’s a well-intended and well-versed rendition, and leaves the audience with the knowledge of Chekhov’s genius, passing on his legacy to the next generation of theatre-goers. It’s strangely coincidental how much of The Cherry Orchard is still relevant today; whether it be the money problems that lead the Ranevskaya family to have to sell their estate (which includes, of course, an orchard of cherries), or the lust and secret desires of betrothed lovers, or the ways in which every human attempts to reinvent themselves and get rid of their label as “poor,” “rich,” or “middle class.” We can relate a great deal to Chekhov’s writing and whilst we may laugh and go along with all the fun, the dark end is nigh. 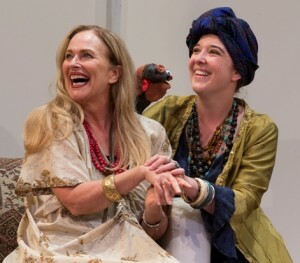 This production seamlessly plays with the duality of silliness and seriousness that has made The Cherry Orchard a famous turning point for modern theatre. It’s not too bold and it doesn’t take itself too seriously, but you get a funny feeling as the play progresses that something is awry and that you are very much a part of it. The New Theatre has put together a worthy representation of one of my most beloved plays, with twists and turns that are pleasant surprises for both the seasoned thespian and the novice onlooker. This entry was posted in Arts, Theatre and tagged New Theatre, Review, sydney, theatre. Bookmark the permalink.